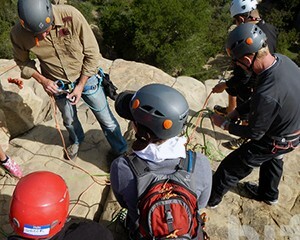 This Technical Canyoneering Course is a beginner to intermediate course which teaches the skills necessary to safely descend canyons as part of a group (being a competent participant and the knowledge to recognize and implement safe canyon practices). This Advanced Canyoneering Course provides students with the tools needed to jump to the next level of technical skill and become competent and safe canyoneers in ALL classes of canyons. This Canyon Essentials Course is designed specifically to provide the next level of skills training through technical instruction and experiential practice. Consider it the 'bridge' between Advanced Canyoneering and Canyon Rescue. 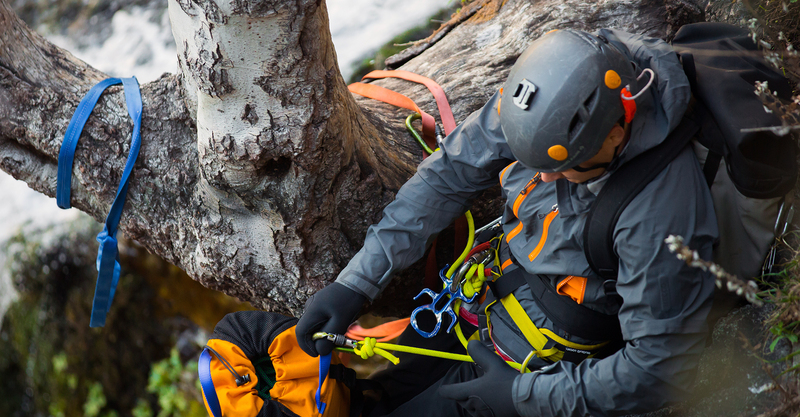 In our Canyon Rescue course, learn the skills necessary to perform immediate, in-canyon self-rescues, partner rescues, and how to assist with group emergencies ... all with your groups' normal racks-and-packs. Book a fun day for family or team building event with one of our Learn to Rappel Workshops! This is a fun day outside learning and practicing something exciting. Give us a shout and pick your date to schedule your own class (for fun, or as a team building activity) for co-workers, friends, family, scouts, outdoors clubs and youth groups. Superb! It’s hard to believe how much material we covered, and how thoroughly we covered it in only 2 1/2 days. Klaus’ knowledge and enthusiasm for the materials is unquestionable; and his ability to conduct and manage the class with the seriousness and attention to detail the material warrants, combined with good-nature and intermittent jokes and laughter made this a truly fantastic course. Your instructors were awesome: very nice, very prepared, very clear in their teaching, very upbeat, very qualified, and very safe and responsible. Everyone there had a great time, including me. Thanks again. What a fabulous day! Great group of people and awesome instructors! You have got to meet these guys! If you haven’t tried this, you’re missing out. They are all about safety first, but they teach in a way that makes you count the seconds to rappel and canyoneer! I’d rate this a 15 out of 10! Can’t wait to see what else they’re cooking up! This is the Ultimate, Ultimate Rescue Course. Why? 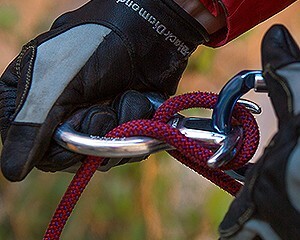 Three reasons, the latest techniques and equipment, the opportunity to practice the techniques in a real-world environment–two times as both rescuer and ‘rescuee’, and instruction in Uber Adventures’ comfortable classroom for knots, mechanical advantage and conversions. HIGHLY RECOMMENDED! The “Learn to Rappel” class was much more informative and exciting than I could have imagined! We went from fearing the edge to fearing we’d run out of time for another rappel! Klaus’ love for canyoneering became contagious as the day progressed and saying that we became “hooked” is an understatement. If your inner child is nudging you to take a leap, Klaus will show you how to do it safely and professionally! This course was FANTASTIC! It far exceeded my expectations. Klaus was an awesome instructor with an impressive knowledge of all things Canyoneering. He gives you hands on experience in several rappelling devices (and rappelling off a Munter hitch), rappel starts in several positions, self-rescue, and building anchors (just to name some of the major components, the course content is far more extensive). He is an organized and patient instructor. Every second of the course is filled with either classroom or hands on experience with little down time. After Klaus’ class, I feel very confident that I could go out and be a member of a Canyoneering Meetup. I would give this class my highest recommendation possible. Klaus rocks!!! This was an excellent class. I’ve been Canyoneering for about 5 years but never fully gotten all of the fundamentals of Canyoneering. A very comprehensive course that enables one to competently descend canyons, even if you don’t have any experience prior. It was a really full class and didn’t skimp on anything. Klaus is an excellent teacher and always makes it fun while packing in so much information. I had attended Klaus’ last training and it was Amazing! I never expected that I will be able to do so much adventure stuff in a 2.5 day course. Klaus is a great instructor and the training was great fun and totally worth the money. Exceeded expectation!!!! This course was great, and it was taught by an even greater guy. Klaus knows his stuff and teaches it well. After only a few days I feel like I can take on just about any canyon. I recommend this course to everyone, and I hope no one hesitates to take it. A great experience! Awesome course. Klaus came prepared with everything needed, taught in an easy to understand way, gave us plenty of practice with all maneuvers, and had a great spot for us to learn in. It was fun and instructive. I’m ready to go Canyoneering. Klaus is an amazing canyoneer and a terrific instructor; smart, funny, engaging – but most importantly knowledgeable and SAFE! He’s one of the few people I trust with my life, literally. If anyone is waffling on whether or not to attend, DO IT. I assure you you will not regret it. This 3 day class was awesome. Klaus was knowledgeable and patient. His technical skills taught me confidence in building my own anchors and validating the strength of others. I enjoyed learning with this group. Klaus was able to give individual instructions to all of us. Can’t wait to get back out there. Uber Adventures’ Technical Canyoneering Course is a fantastic introduction to Canyoneering for anyone who has wandered down a slot canyon and been frustrated by the first impassable waterfall – or anyone who is interested in getting started safely in the sport. Klaus is a patient and skilled teacher with a passion for introducing people to Canyoneering. The course is packed with information and gave me the confidence to safely navigate a real canyon. Aside from the instruction, the class is a great experience – Klaus introduced us to the local Canyoneering community and continues to be a resource for Canyoneering and gear information. Thanks Klaus! What an amazing instructor! Klaus takes you to a new level in Canyoneering! His passion for the sport is contagious! I can’t wait to put my new skills to the test in a canyon. Awesome course! Very informative and hands on! Well worth the money and the drive from Phoenix! Thank you Klaus! You couldn’t ask for a better, more experienced instructor than Klaus. 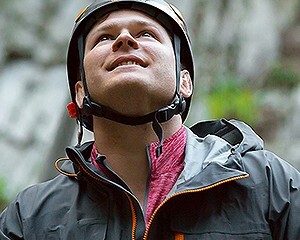 He has a real passion for Canyoneering and it shows! He came prepared with a very detailed course outline that taught the basics of Canyoneering. I came away with a very good understanding of the skills and principles. The class was fun, informative and has piqued my interest to take it to the next level. This is the place if you want to LEARN! I enjoyed the course, all thanks to the way the course was designed and yes of course, what I call the ‘Klaus Factor’!! You are a great teacher. You took the time to make each one of us comfortable and made learning a fun process rather than just boring theory! This class gives a 360 degree view of Canyoneering to beginners. 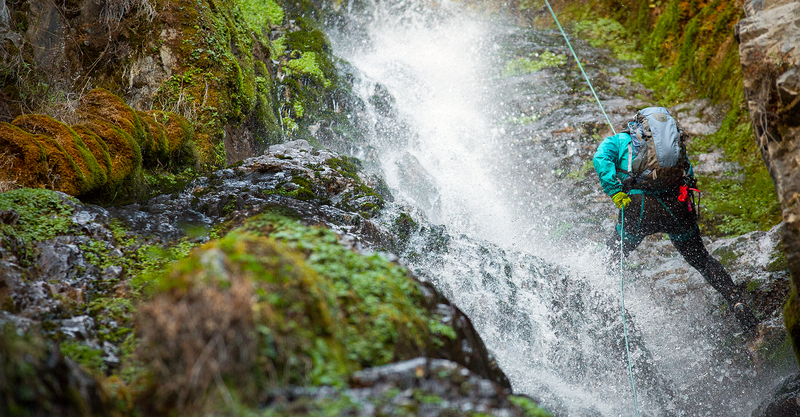 If you’re looking to learn Canyoneering, this is likely the best place to start. Klaus is not just an expert in the sport, but he is a true teacher as well. He teaches various tools and techniques, emphasizing how to practically apply them in a canyon. This class was jam-packed with exciting, fun and useful information. I’m looking forward to my first canyon. Klaus is an excellent teacher and Uber Adventures has an excellent curriculum. In fact, this course has to be the best, most comprehensive in the industry. Klaus is extremely thorough. 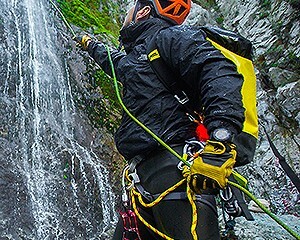 He not only teaches the skills, but he explains the principles behind all the techniques for Canyoneering. Even though I’m not a rookie, this course contained tons of new and useful information, technique instruction and skill-building that I can now use to make sure my future adventures are safer and more fun! Excellent hands-on training mixed with clear explanations of how-why-and-when we use these skills in practical situations! I feel MUCH more confident about Canyoneering now! Thanks, Klaus! This was a great course with an excellent teacher and a really great group of people. We all learned a lot and Klaus showed us how to work together as a team. Klaus is a very funny, informative, and skilled teacher. I entered this class knowing almost nothing about Canyoneering … and I learned more than I expected and had one of the funnest times ever, while learning a new sport. What a great class. Highly recommended! Klaus is obviously passionate about teaching and uses class time efficiently. He really packs in a lot of info and gives time to practice. Great value for the money. Great fun and I learned a lot of things that are useful for other sports: emergency signals, knots, bends, hitches, etc. This is the place to learn about Canyoneering and Wilderness / Adventure topics! Took a class this last weekend there. Klaus (the owner) brought in an experienced professional in the Wilderness First Aid/ First Responder/ EMT field to teach a Wilderness First Aid Class. I used to have an EMT basic license in LA county and I can tell you that the instructor knew what he was talking about and had great real life based tips to share. Now I feel much better about leading backpacking trips. We learned a structured approach to dealing with backcountry emergencies from an excellent instructor with more than 20 years of experience as an EMT. After 2 days of exercises being victims and rescuers, I feel much more confident in my ability to deal with actual emergencies, effectively. Had lots of fun here, feel like I learned a ton of stuff in just one weekend. Big shout out to our instructor, Matt, for keeping the course lively and fun while educational. This is my favorite class from Uber Adventures so far. It’s like seeing the last installment in a series … everything comes together … I feel so much more complete in my canyoneering skills now. I highly recommend this class for everyone … because MY life may depend on YOU someday! I cannot say enough! 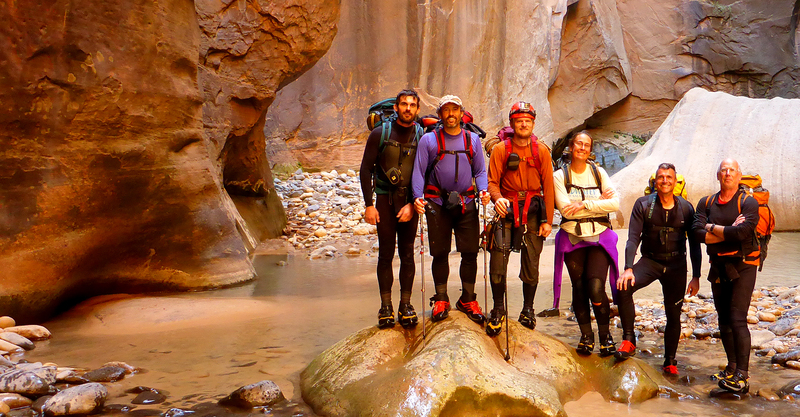 Thank you Steve & Klaus for an amazing, educational, inspiring, adventurous journey through canyoneering 101! Wishing I could do it all over again. Most excellent job of presenting a lot of technical material in an orderly, understandable progression. Many thanks to Steve and Klaus for their wealth of knowledge and experience and for their patient, upbeat, encouraging style of teaching. This was a great course! Steve and Klaus were super-knowledgeable and experienced and freely shared their knowledge with us. I learned a lot – just hope I will remember it all by the time I can get back to a canyon and put it into practice! Thank you, thank you, thank you Steve and Klaus for this excellent instruction. We received just the right combination of verbal instruction, demonstration and hands-on practice. The course gave me the confidence that I will know what to do and how to do it in a canyon emergency. Every serious canyoneer should take this course: the knowledge is both useful and fun to learn. Awesome as always! Steve and Klaus provided ‘impeccable’ guidance and instruction throughout the course. Thanks for another set of tools, building blocks, and great instruction! Klaus and Steve, what a team! Once again, I learned so much from your instruction! Thank you for taking the extra time for each participant to thoroughly practice each skill!